FRIEDA: Oh, great search eagle. Where can we find the New Moose? 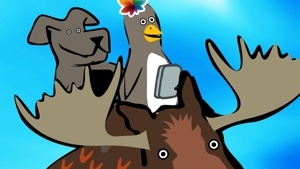 Eaglebot [slyly]: “You will find the New Moose on Safe Island. MOOSE: I have my doubts, but he can search for anything. Hop on! NARRATOR: As they journey back to Safe island, on the Moose’s back, a debate arises among the group. There are Optimists and Pessimists about the open Internet. Globality! Globality! Whatever could go wrong? The Net holds every creature known to Dog UH-OH! Not everyone will put your interests first. WHY NOT?! You could face a future in some gulag. GOO? EWWW! Or lose your reputation — or even worse! DO YOU MEAN…? The diversity of online life is thrilling. I’M THRILLED! So many different folks with different lives. VIVA LA! But you could find good teachers, lovers, even wives! DO IT! AND HUSBANDS! Globality! Globality! whatever could go wrong! ONWARD! They call it Safety Island for good reason. UH-HUH! Cheat ‘n steal n’ lie right to your face. BAD PLACE! Globality! Globality! It’s such a sham reality. SHAM ON YOU! Globality, a fact we need not heed. SO THERE! How wonderful to join a different rule set. YES! You may find one you like much more. YOU WILL! Let’s go and find those you have not met yet GO FOR IT! So exciting, really, to explore. EXPLORE! Globality! Globality! it’s never been like this before. NEVER !